ARTESIA — The Artesia Police Department has made an arrest in connection with the 2012 murder of a local security guard. Bobby Smith, 24, of Artesia, was arrested Wednesday and charged with first-degree murder in the Jan. 29, 2012, shooting death of Michael Evans, 24, also of Artesia. Smith was also charged with second-degree shooting at a dwelling or occupied building or shooting at or from a motor vehicle, thirddegree tampering with evidence, and fourth-degree receiving stolen property (firearms). The crime occurred in the late evening hours of Jan. 29, 2012, in the 100 block alleyway between Fourth and Fifth Streets. At approximately 10:46 p.m., the APD had been contacted by Evans, a guard with Sierra Security, concerning a suspicious subject who had attempted to sneak up on him while Evans was parked near The Derrick Floor statue at Sixth and Main streets. Evans told police he had lost sight of the subject but then reported the subject was headed toward him. The telephone conversation was then terminated. Upon arrival in the alleyway, APD officers located Evans in the driver’s seat of his truck with an apparent gunshot wound to the head. He was transported to Artesia General Hospital, where he was pronounced dead. Evans sustained gunshot wounds to the left side of his head and left arm from a .410-caliber revolver. After viewing security footage of the crime and speaking with witnesses who reported hearing gunshots and seeing Smith walking back to his residence hunched over as if concealing something, as well as witnesses who stated Smith was seen wearing the clothing visible in security footage, the APD executed a search warrant on Smith’s apartment in the 900 block of West Texas Avenue on Jan. 31, 2012. During the execution of that warrant, clothing items consistent with those seen on the subject in the security video were found, along with a spent .45 Long Colt casing, several spent and live .410 shotgun shells, and a nickel or chrome-colored .410-.45 Taurus Judge revolver concealed in the ceiling of Smith’s bedroom. Smith was originally taken into custody in early February 2012 and was previously housed in a criminal/medical evaluation facility while competency was determined. 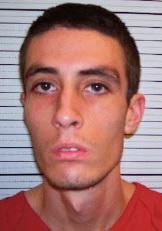 He is currently being held at the Eddy County Detention Center on a $750,000 cashonly bond. He has not yet been arraigned, and a trial date has not been set.